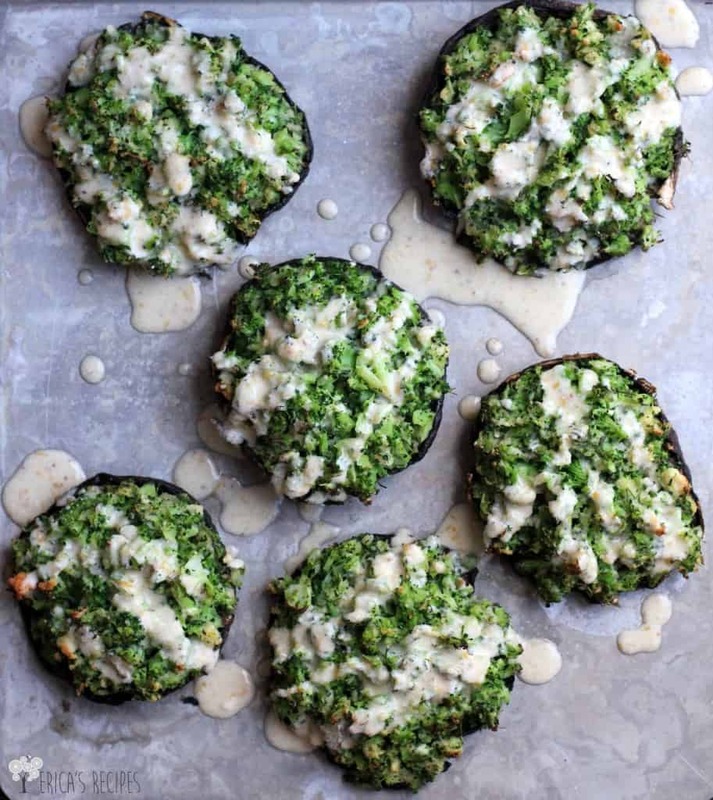 Light and healthy, these vegetarian Broccoli-Stuffed Portabello Mushrooms with Dijon-Cheddar Sauce will satisfy your comfort food craving but not break the calorie bank. So delicious, your whole family will love them. Since my daughter and I, for the most part, have given up eating land animals for a while, I am now faced with the challenge each evening of preparing dinners that meet the different dietary needs and desires of four people. A couple considerations: 1) I am not about to cook multiple meals – ain’t gonna happen; 2) we can’t afford to eat seafood every night; and 3) my husband does very well eating a couple vegetarian dinners a week without complaint (which I truly appreciate), but if I removed meat entirely he would not be happy. So, beautiful, healthy, giant stuffed shrooms were my solution one night …paired with a nice, lean grilled Top sirloin steak. …Yep, I know how to keep mah man happy. I wanted a new vegetarian dish …a broccoli-cheese something, a stuffed portabello something. I loooove stuffed mushrooms, as evidenced here, and I wanted THAT in the form of dinner. 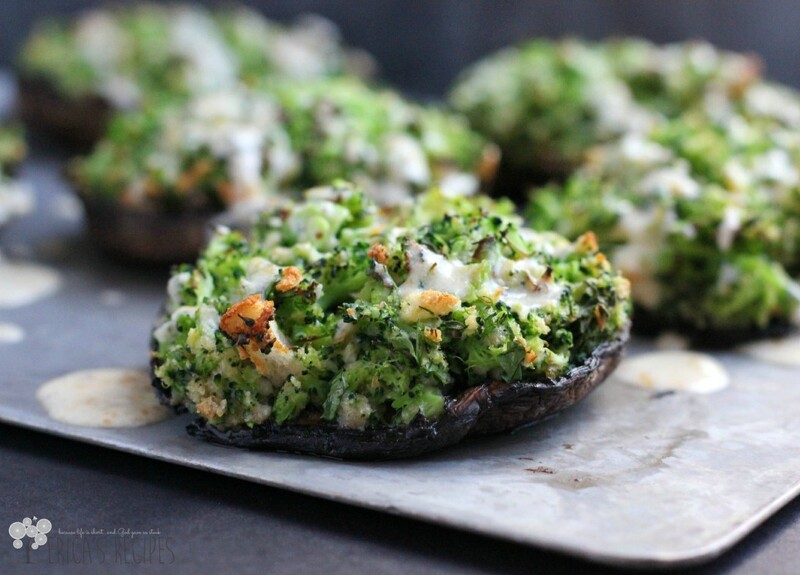 I had also used broccoli as a stuffing in healthy Potato Skins – broccoli makes a fabulous stuffing! – so that was the clear path to take. Then adding a drizzle of light cheddar cheese sauce was just logical. These broccoli-stuffed caps were soooo good – they really really were. It’s amazing how when I eat something like these, I don’t even think about the fact that it’s vegetarian. Portabellos check that box for me. These stuffed shrooms even reheated really well the next day with a quick zap in the microwave. And only 195 calories per cap! Prepare the mushrooms: wipe off any dirt with a lightly damp paper towel. Remove the stems and discard (these can be saved, diced, and added to the stuffing, but mine were tough so I didn't save them). Using a spoon, gently scrape off the gills on the underside of the mushroom caps. Spray both sides with olive oil and place upside down on a bake sheet. Blanch the broccoli in the boiling water 2 minutes. Transfer to a ice bath to stop the cooking. Drain. Chop finely (this can be accomplished easily with a mini chopper or by pulsing in a food processor). In a large bowl, combine the chopped broccoli, bread crumbs, parsley, thyme, egg, 1/2 t salt, and pepper. Distribute the stuffing into the mushrooms. Bake at 400F for 15 minutes or until mushrooms are cooked through and juicy and the stuffing is lightly browned. While the mushrooms are cooking, prepare the cheese sauce. In a medium saucepan over medium-high heat, whisk the butter and flour until smooth and bubbly. Cook an additional minute to cook the flour. Whisking constantly, slowly add in the milk. Cook, stirring constantly, until thickened enough to coat the back of a wooden spoon. Remove from the heat and whisk in the cheese, Dijon, and 1/4 t salt until smooth. 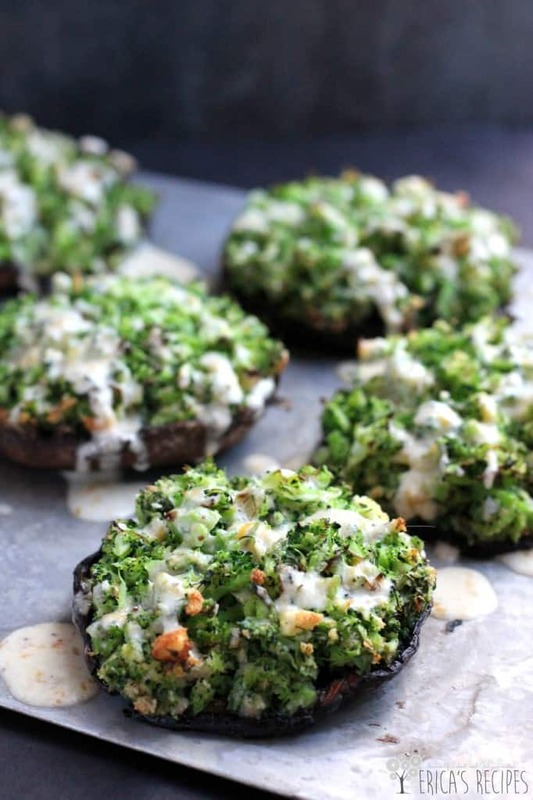 Serve the stuffed mushrooms with sauce drizzled over. Yield: 3 servings as a main course; 6 as a side. You can easily double this recipe if needed to serve more people, but I would not bother doubling the Dijon-Cheddar Sauce - it makes enough as written. We only used about half of it for our mushrooms, then my daughter and I found the rest of the sauce worked awesome as an impromptu fondue for crusty bread. Oh those look so good Erica! I absolutely love portobellos, as does my youngest son. I might have to make them as a treat for he and I! No one else likes mushrooms, but that just means more for us! Pinning! These look yummy! I’m also not a big meat eater but my husband is, so I’m always trying to find meals that will satisfy us both! MMM, sounds great. I love mushrooms, and could eat them all the time. The husband, though, he doesn’t care for them. So, your solution of a steak for the husband and a stuffed shroom for me is perfect! Pinning these beauties for later. Thanks! Who needs meat when u have these! Stumbled & pinned Erica! I haven’t made stuffed mushrooms in forever! Those looks delish.. pinning! These look so appetizing right now (at 8am)! 🙂 My husband is a die-hard meat and potatoes man, so he’s not quite as forgiving of any vegetarian meals in our house. I bet these might be a good way to sway him, given that they have eggs and cheese. 🙂 That cheese sauce looks so delicious. Yum looks really good. I really love portabello mushroom, it tastes so rich, thanks. What a great idea….very light, healthy and great for summer!! These look amazing. I love mushrooms and I love broccoli. Perfect combination. Stopping by from the Weekend Retreat Link Party! 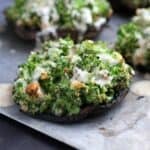 Love this recipe..as a vegetarian, I’m always on the look out for new veggie dishes to make and these stuffed mushrooms look awesome. What a great hearty vegetarian dish. I’ll be making this. We have various food allergies in my family, but I won’t cook separate meals.. so some things get cheese, some nuts. etc. I think this a delicious vegetarian meal or nice side with a steak. Pinned. Oh, Erica. So I’m not even a fan of mushrooms, and this entree looks absolutely DIVINE! Seriously. How can you go wrong with stuffing anything with broccoli and topping it with a dijon-cheddar sauce? I mean… YUM. Also, this was one of my favorite links shared in last week’s #thatsfreshfriday blog party! I hope you don’t mind that I’m sharing it tonight at my blog as a favorite and linking back to you. Happy Thursday, and I hope to see you back at our link-up this week! Here’s to a great weekend! Theese look delicious! Also beautiful pics! I fill the mushrooms with mix cheese and hebs. Stuffing with brocoli is a wonderful idea and makes a great combiation. Visitig from Fodie Friday! Have a great weeked Erica! Stopping over from Foodie Fridays. These look SO delicious! Pinned to try! 17 Delicious Foods You Should Be Eating For Better Skin | Take control of your health! A Very Vegan Holiday Menu | Let's Nom Nom!